Traffic approaching the prohibited left turn onto S. Dogwood Trail in Southern Shores. This was the weekend of the great South Dogwood Trail experiment in Southern Shores…the weekend when, working with NCDOTand the town of Kitty Hawk, a left hand turn onto South Dogwood Trail off US 158 was prohibited. That’s hard to say, and there probably will not be anything approaching an answer for some time. From the ground, observing the intersection, it appeared as though traffic was moving in a typically slow summer pattern to the intersection of US 158 and NC 12 about a mile to the west. That’s the intersection that leads to Duck and Corolla and is invariably a bottleneck on summer weekends on the Outer Banks. There was significantly less traffic on South Dogwood Trail than there has been over the past few years. However, because right hand turns and through traffic coming from Kitty Hawk road could still access the blocked street, there was still an increase in use. 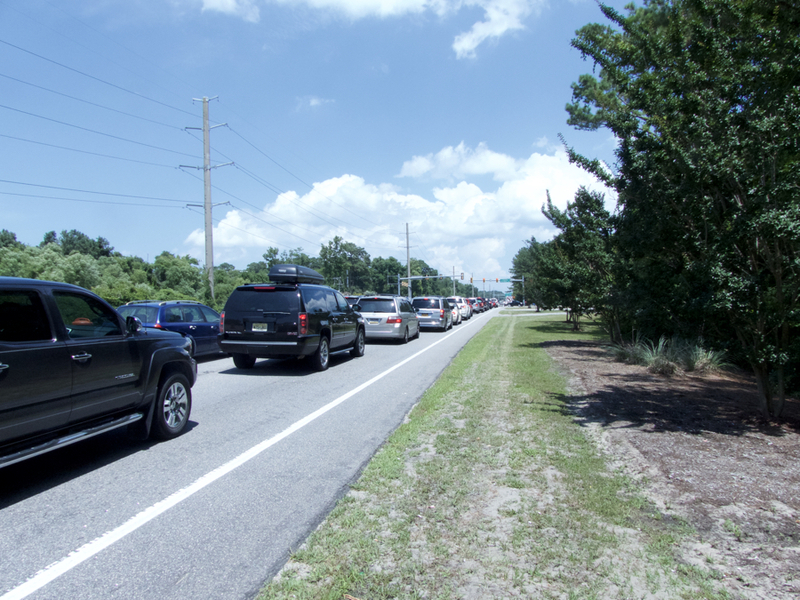 The use of South Dogwood Trail as a way to get around the 158/12 bottleneck has become a significant safety issue for Southern Shores. The roads are narrow, and designed for residential use. None of the roads that are used after leaving the highway were ever designed for the volume of traffic that uses them on a weekend summer day. Much of the problem lies with GPS systems that tell drivers the best route is through the tree-lined streets of residential Southern Shores. NCDOT seemed to do a very good job of telling drivers that a left turn at S. Dogwood was prohibited. Signage and barrier barrels sealing off the turn lane, kept motorists from even getting into the left turn lane. Will the experiment be repeated? That is a possibility, although the the state and local authorities want to go over data NCODT collected before drawing any conclusions. Summer on the Outer Banks is spectacular. Check out Joe Lamb Jr., & Associates. for vacation possibilities.